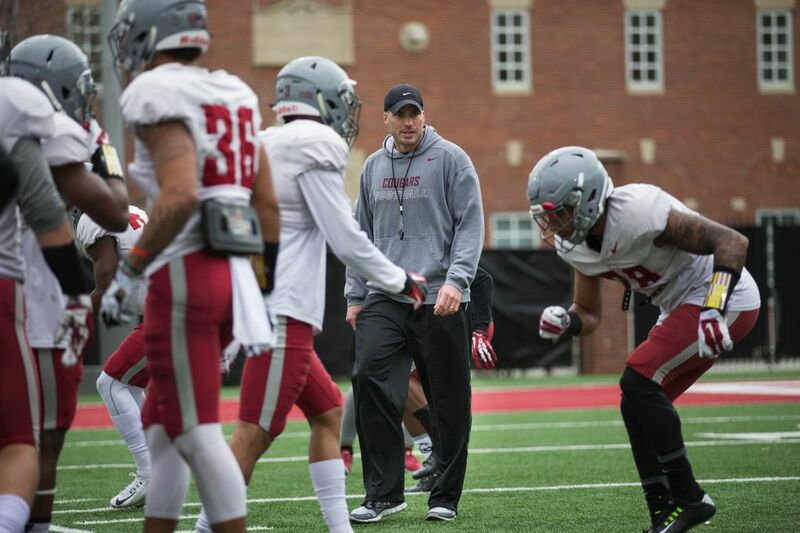 The Speed D moniker for WSU's defense was intended to be an internal thing, but now in Alex Grinch's third year as defensive coordinator it's become as synonymous with his defense as the Air Raid label is with WSU's offense. The “Speed D “moniker that’s become synonymous with Washington State’s defense this year was never conceived as a flashy, iconic marketing gimmick the way the Air Raid offense started out. Grinch doesn’t recall how the term came into being, and he says he wishes he did, because he wants to give credit where it’s due. But regardless of who coined it, Grinch concedes that outside linebackers coach Roy Manning probably had a lot to do with its marketing. Manning’s energetic post-game Twitter videos, where he breaks down everything the offense, defense and special teams did to help the Cougars earn a win, have earned him a devoted following of recruits and Cougars fans. After a season and a half of hearing Manning hoot enthusiastically about the Speed D’s exploits on Twitter, the name has stuck. 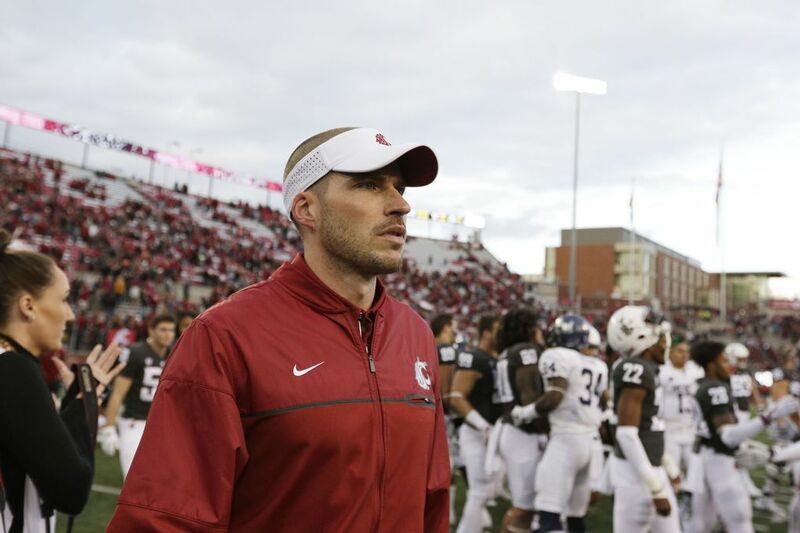 It’s now on T-shirts and caps that the players wear around campus, and it’s become a rallying point around which the Cougars’ defense has found an identity. In Grinch’s third season as defensive coordinator, his defense appears to have taken flight. As the 11th-ranked Cougars (5-0, 2-0 Pac-12) face Oregon (4-1) this Saturday at Autzen Stadium, WSU ranks second in the Pac-12 behind UW in total defense, allowing only 275.2 yards per game. The Cougars also boast the conference’s top passing defense, and its fifth-ranked rush defense, and are second in the Pac-12 only to Oregon, with 17 defensive sacks. Those numbers even hold up nationally. WSU has the country’s 11th-ranked overall defense and the Cougars are seventh nationally in passing yards allowed (146.6 yards per game). The 20.2 points per game the Cougars have allowed this season is three scores under the 38.6 points opponents averaged against WSU in 2014, the year before Grinch arrived. WSU has forced 12 turnovers so far, and is on pace to surpass the 24 turnovers the defense tallied in 2015, the most it’s had under Grinch. “They’ve improved every year under Grinch and I’m really impressed with how aggressive they play,” said Pac-12 Network analyst Nick Aliotti, who was formerly the defensive coordinator at Oregon. What is the “Speed D”? So what exactly is the “Speed D”? Grinch’s brand of defensive football is predicated on an aggressive, ball-hawking style of play that emphasizes speed, duplicity and the forcing of turnovers. Grinch’s scheme is rooted in the style of defense he learned under his uncle, Gary Pinkel, at Missouri, and former Missouri defensive coordinator Dave Steckel, who’s now head coach at Missouri State. But he’s customized it to duel the spread, high-scoring offenses of the Pac-12, and to the kind of kid he’d be able to recruit to Pullman. Missouri’s stout SEC defense under Steckel worked primarily out of a four-man front. Grinch’s defense is multiple, but based on a three-man front, with the added versatility of a roving nickelback who’s a hybrid linebacker/safety, and a rush linebacker who frequently plays up on the line. WSU’s defense is fast but undersized because Grinch decided that speed was the most important characteristic to look for in recruiting. That’s how a player like linebacker Jahad Woods, who’s 6-feet, 214 pounds, ended up on WSU’s roster. Woods didn’t have many offers coming out of San Diego’s Helix High because he was deemed a hair too short to be your prototypical inside linebacker at the FBS level. But Grinch offered him a scholarship because he was impressed by Woods’ speed – he ran the 100m in just a shade over 11 seconds in high school – and his toughness and football instincts. Now a redshirt-freshman, Woods has flourished in Grinch’s system. He’s started two games since senior Peyton Pelluer was lost for the season to a broken foot, and against USC, he had the strip-sack of Sam Darnold that preserved WSU’s win. Another unique aspect of Grinch’s defense is how frequently it incorporates pre-snap movement like stemming or stunting on the defensive line. “They do it more than anybody,” says Yogi Roth, another Pac-12 Network college football analyst. The idea behind stemming is to approach defensive strategy with an offensive mentality. “It’s really what offenses do to us. They shift and motion all the time and they do it to make us get less help from the sideline and have less time to process the picture in front of us. It’s commonplace on the offensive side of the ball,” Grinch said. “The idea simply being, to make offenses make decisions late in the cadence and try to eliminate some of the help from the coaching box – there’s a play called, now (we move) and it has to be changed. Which just increases thinking on offense. At Missouri, the Tigers used occasional pre-snap movement to hide a blitz front or pressure package. The Cougars, however, stem so frequently it’s no longer a function of scheme or matchup, it’s become part of their defensive identity. This can be particularly confusing for a young offensive front, such as the one USC resorted to using midway through last week’s game when injuries forced the Trojans to play two freshmen on the line. “It’s hardest on the guys up front,” Roth says. “Think about being an offensive lineman, and you’re six inches away from someone you have to block. That’s hard in itself. Now, make them move, and you change your point of attack right before the snap. Now, you have to be catlike-quick and extremely athletic, because of the size and athleticism of Hercules Mata’afa, Frankie Luvu and even Daniel Ekuale. That combination of perfectly disguised and executed pre-snap activity, plus above average speed and athleticism, has become the calling card of Grinch’s defense, Roth says. Grinch’s main objective is to simplify everything to minimize thinking for his players so they are freed to play fast. Grinch’s checklist of priorities has been drilled into the mind of every defensive player: “gaps, leverage, check down, rally” and his terminology is simpler than most, says former WSU linebacker, Jeremiah Allison, who played for Grinch in 2015. 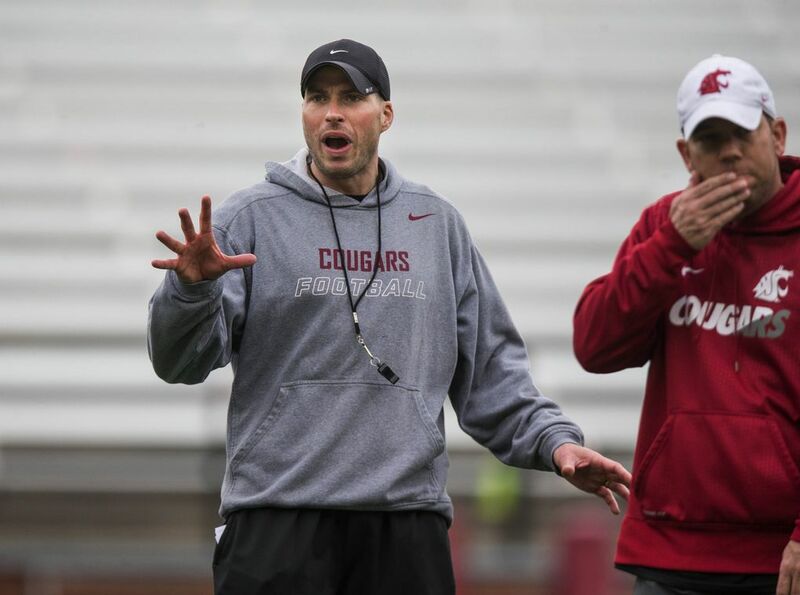 Also, the Cougars are trained to go into every play looking to force a turnover. In his first season, Grinch conducted a study to determine whether turnovers forced correlated to wins. He found that all Power Five teams in the 2014 season that forced at least 24 turnovers averaged nine wins. Those results have held up for WSU too. In 2015, WSU had 24 turnovers. The Cougars won nine games. In 2016, WSU had 23 turnovers. They won eight. This season, WSU has 12 turnovers, and the Cougars are 17-3 in the Grinch era in games where they’ve forced multiple turnovers. Put all these components together – the scheme, the active stemming, the decision to recruit speed, and this emphasis on turnovers – and that’s part of the reason why WSU is playing its best defense of the Mike Leach era. It also helps that nine of the 11 defensive starters the Cougars began the season with were reprising their roles from last year. “Our guys play real hard and they know their role better, so they’re real invested in what he’s teaching and what we’re trying to do,” Leach said. But Grinch himself, the expectations he’s set and the energy he brings, are a huge part of the equation too, says WSU quarterback Luke Falk. “I think coach Grinch does a great job of firing those guys up and I think his assistants really relay the same message: They expect turnovers, they expect to score points, they fly around,” Falk said. “They make hustle plays that you don’t have to be a high star or great athlete to do.